What is the name of this numeral system? In a XVth century french manuscript on arithmetic and astrology, there is a description of a numeral system as follows (it starts here in the manuscript). I would like to know the name (if any) of this numeral system, who first came up with it (if this is known), and relevant references about it. According to S.Lamassé in Scientific Sources and Teaching Contexts Throughout History: Problems and Perspectives (page 130, footnote 28. A.Bernard & C.Proust, Eds. Springer, 2014. ), this a system that is close to the Algorismus Linealis. Now, a copy of this short incunable is available online, but I must say I do not find the comparison too enlightening. Lamassé seems to wish to regroup them under the idea of "a table with counters", but the differences are quite stark to me. Yet, since there doesn't seem to be a better answer in the literature, I'll leave it at that. Not the answer you're looking for? Browse other questions tagged mathematics terminology notation number-theory or ask your own question. Has a digit ever been used to represent the number “10”? How did the theory of the Horus-eye fractions originate? Who discovered the singular cup product? Who said $\pi$ is a constant since it is not even a real number? Were ratios of incommensurable magnitudes interpreted as irrational numbers prior to Fibonacci? 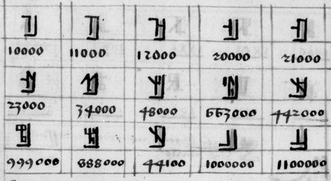 What are early examples of the rare notational convention to make the sign of the real number represented by a letter depend on the typography?